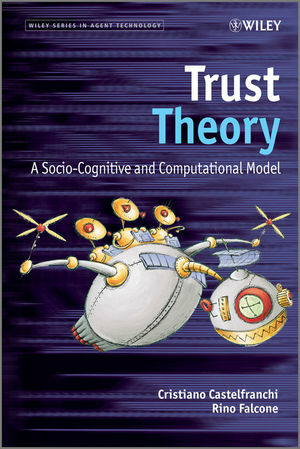 This book gives an accessible explanation of the importance of trust in human interaction and, in general, in autonomous cognitive agents including autonomous technologies. The authors explain the concepts of trust, and describe a principled, general theory of trust grounded on cognitive, cultural, institutional, technical, and normative solutions. This provides a strong base for the author’s discussion of role of trust in agent-based systems supporting human-computer interaction and distributed and virtual organizations or markets (multi-agent systems). Proposes a principled, general theory of trust grounding on cognitive, cultural, institutional, technical, and normative solutions. This book will be a valuable reference for researchers and advanced students focused on information and communication technologies (computer science, artificial intelligence, organizational sciences, and knowledge management etc. ), as well as Web-site and robotics designers, and for scholars working on human, social, and cultural aspects of technology. Professionals of ecommerce systems and peer-to-peer systems will also find this text of interest. Cristiano Castelfranchi is full professor of Cognitive Sciences at the University of Siena, Italy, and Director of the Institute of the Cognitive Sciences and Technologies (ISTC) of the Italian National Research Council (CNR). Cristiano has a background in linguistics and psychology, and is active in the Multi-Agent Systems, Social Simulation, and Cognitive Science communities. He was program chair of AAMAS 2002, and is chair of several international workshops. He has published 11 books (3 in English), and more than 150 conference and journal articles. Rino Falcone is Leader Researcher for the T3 (Trust Theory and Technology) group at the Institute of the Cognitive Sciences and Technologies (ISTC) of the Italian National Research Council (CNR). His scientific interests include Natural Language Processing, Plan Recognition, Multi-agent Systems and Agent Theory. Rino has published more than 100 conference and journal articles, organized several international conferences, and edited several special issues of international journal on these topics. 1 Definitions of Trust: From Conceptual Components to the General Core. 1.2 Missed Components and Obscure Links. 1.3 Intentional Action and Lack of Controllability: Relying on What is Beyond Our Power. 1.4 Two Intertwined Notions of Trust: Trust as Attitude vs. Trust as Act. 1.5 A Critique of Some Significant Definitions of Trust. 2 Socio-Cognitive Model of Trust: Basic Ingredients. 2.1 A Five-Part Relation and a Layered Model. 2.2 Trust as Mental Attitude: a Belief-Based and Goal-Based Model. 2.3 Expectations: Their Nature and Cognitive Anatomy. 2.4 ‘No Danger’: Negative or Passive or Defensive Trust. 2.5 Weakening the Belief-Base: Implicit Beliefs, Acceptances, and Trust by-Default. 2.6 From Disposition to Action. 2.7 Can we Decide to Trust?. 2.8 Risk, Investment and Bet. 2.10 The Other Parts of the Relation: the Delegated Task and the Context. 2.11 Genuine Social Trust: Trust and Adoption. 3 Socio-Cognitive Model of Trust: Quantitative Aspects. 3.1 Degrees of Trust: a Principled Quantification of Trust. 3.2 Relationships between Trust in Beliefs and Trust in Action and Delegation. 3.3 A Belief-Based Degree of Trust. 3.4 To Trust or Not to Trust: Degrees of Trust and Decision to Trust. 3.5 Positive Trust is not Enough: a Variable Threshold for Risk Acceptance/Avoidance. 3.6 Generalizing the Trust Decision to a Set of Agents. 3.7 When Trust is Too Few or Too Much. 4 The Negative Side: Lack of Trust, Implicit Trust, Mistrust, Doubts and Diffidence. 4.1 From Lack of Trust to Diffidence: Not Simply a Matter of Degree. 4.6 Implicit and by Default Forms of Trust. 4.8 Trust on Credit: The Game of Ignorance. 5 The Affective and Intuitive Forms of Trust: The Confidence We Inspire. 5.1 Two Forms of ‘Evaluation’. 5.2 The Dual Nature of Valence: Cognitive Evaluations Versus Intuitive Appraisal. 5.5 Relationships Between Appraisal and Evaluation. 5.7 Trust Disposition as an Emotion and Trust Action as an Impulse. 5.8 Basing Trust on the Emotions of the Other. 5.9 The Possible Affective Base of ‘Generalized Trust’ and ‘Trust Atmosphere’. 5.11 Conclusions About Trust and Emotions. 6.1 Mental Ingredients in Trust Dynamics. 6.2 Experience as an Interpretation Process: Causal Attribution for Trust. 6.3 Changing the Trustee’s Trustworthiness. 6.4 The Dynamics of Reciprocal Trust and Distrust. 6.5 The Diffusion of Trust: Authority, Example, Contagion, Web of Trust. 6.6 Trust Through Transfer and Generalization. 6.7 The Relativity of Trust: Reasons for Trust Crisis. 7 Trust, Control and Autonomy: A Dialectic Relationship. 7.1 Trust and Control: A Complex Relationship. 7.2 Adjusting Autonomy and Delegation on the Basis of Trust in Y. 8 The Economic Reductionism and Trust (Ir)rationality. 8.1 Irrational Basis for Trust? 8.2 Is Trust an ‘Optimistic’ and Irrational Attitude and Decision? 8.3 Is Trust Just the Subjective Probability of the Favorable Event? 8.4 Trust in Game Theory: from Opportunism to Reciprocity. 8.5 Trust Game: A Procuste’s Bed for Trust Theory. 8.6 Does Trust Presuppose Reciprocity? 8.7 The Varieties of Trust Responsiveness. 9 The Glue of Society. 9.1 Why Trust is the ‘Glue of Society’. 9.2 Trust and Social Order. 9.3 How the Action of Trust Acquires the Social Function of Creating Trust. 9.4 From Micro to Macro: a Web of Trust. 9.6 Is Trust Based on Norms? 9.7 Trust: The Catalyst of Institutions. 10 On the Trustee’s Side: Trust As Relational Capital. 10.1 Trust and Relational Capital. 10.2 Cognitive Model of Being Trusted. 10.3 Dynamics of Relational Capital. 10.4 From Trust Relational Capital to Reputational Capital. 11 A Fuzzy Implementation for the Socio-Cognitive Approach to Trust. 11.1 Using a Fuzzy Approach. 11.5 Implementation with Nested FCMs. 11.6 Converging and Diverging Belief Sources. 11.7 Homogeneous and Heterogeneous Sources. 11.8 Modeling Beliefs and Sources. 11.9 Overview of the Implementation. 11.10 Description of the Model. 11.14 Contract Nets for Evaluating Agent Trustworthiness. 12.1 Main Difference Between Security and Trust. 12.2 Trust Models and Technology. 13 Concluding Remarks and Pointers. 13.2 Neuro-Trust and the Need for a Theoretical Model. 13.3 Trust, Institutions, Politics (Some Pills of Reflection).